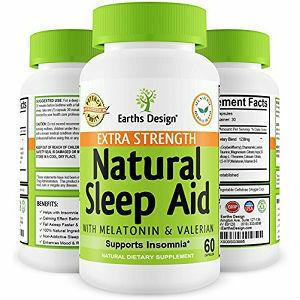 Earths Design Natural Sleep Aid is an all-natural, drug-free supplement that aims to help regulate sleep cycles and promote calmness and relaxation before bed. It is designed to help you sleep without the grogginess associated with over-the-counter and prescription medications. It claims to be able to help you fall asleep and stay asleep using natural, non-habit forming ingredients. Ingredients such as valerian root, lemon balm, and passion fruit, are well known for their benefits in aiding sleep. Quite a few of the ingredients in this product such as 5-HTP, GABA, L-Tryptophan, and L-Taurine work on certain neurotransmitters in the brain to promote a restful night’s sleep and to calm anxiety. Melatonin is a well-known substance that is found naturally in the body and can be taken to help induce sleepiness over short-term periods of insomnia. Darkness naturally signals the body to produce more of this chemical, but in some people, insufficient melatonin is produced, so adding this supplement before bed may help these people to fall asleep more easily. There are no fillers, artificial colors, sweeteners, or other ingredients found in this product. Earths Design lists the dosage as two capsules, but does not provide more specific directions about when to take them, or whether they should be taken with food or water. Some of the included ingredients have possible side effects in large doses, but because it is a proprietary blend, it is difficult to predict the likelihood of side effects. People who are taking medications for sleep or sedation should not take this product. Women who are pregnant or breastfeeding should not take this product. Anyone who has liver, kidney, or blood disorders should also avoid this product, as many of the ingredients may worsen symptoms or have adverse effects with medications. Magnesium citrate may cause an allergic reaction in rare cases. St. John’s Wort can cause a number of side effects including skin rash, headaches, strange or vivid dreams, and upset stomach. A 60 capsule bottle is available through the company’s website for $20.99 (down from $49.99). Through Amazon, it can be found for as low as $13.99. The company operates a 100% money-back guarantee and certifies all of its products with third-party testing and facility inspection. However, there are no specific details about this guarantee, only that you should contact the manufacturer for details. Reviews for this product are overwhelmingly positive, with only a small contingent reporting it ineffective. This product contains a variety of ingredients known to promote sleep and relaxation, and has all of its products tested by a third-party. While it operates a money-back guarantee, the large number of ingredients, and unknown quantities of each may cause adverse effects in some people, especially as a number of them may cause side effects. The lack of clarity around dosage means that individuals will need to do some trial and error to discover their best time of dosage. There is also a lack of clarity around the money-back guarantee as no actual details are provided about it. Bernard Spradlin	reviewed Earths Design Natural Sleep Aid	on November 30th	 and gave it a rating of 2.5.